Mölgg is not a typical Sicilian last name. It sounds northern, perhaps from the Trentino Alto Adige region – and in fact, it is. Michele Mölgg came to his vineyard in southeastern Sicily for love. Born in the heights of the Fiemme Valley, Michele graduated in chemistry and began work in Milan. In the ‘90s, his company transferred him to Catania – a Sicilian town that, at the time, earned its nickname as the Silicon Valley of Italy. A wine lover with an Enology degree, Michele got to know Sicilian grapes. He had an intuition for the potential of Nero d’Avola, and the next decade would prove him to be right. On the weekends, Michele likes to explore the portion of Sicily where he lives. He goes as far as Scicli, a splendid Baroque town that, after years of being forgotten, is about to earn its UNESCO World Heritage Site title. In Scicli, the landscape fascinates him, particularly the hills that overlook the sea. He tells us that where now there sit villas, until the 1950s only vineyards existed. Nearly all of the vines have been uprooted in the name of these vacation homes, or reduced to tiny parcels. Michele found one, the last one, and decided that this was the place. In the beginning in 2002, the dream of making wine seemed too big for him to do alone. 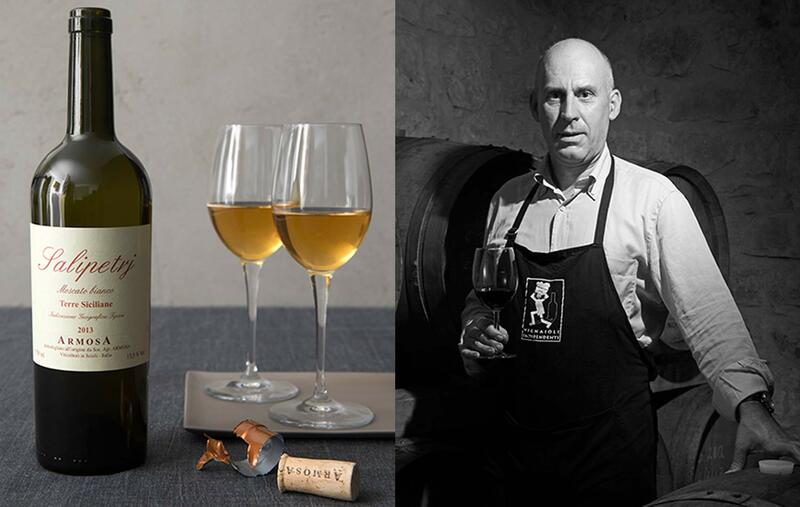 Armosa, the name of his winery, is the acronym of its three shareholders, one of whom brings in grapes from seaside vineyards. There, the Nero d’Avola takes on a savoury aspect, and Michele dares to use it for a late harvest wine, the Yrminum. Some projects, however, require great vision and intuition, and so Michele continues a separate path of adventure on his own. In a land where the earth is nearly entirely dedicated to reds, Michele, ever the good Italian of Trentino heritage, dreams of whites. He dreams of Moscato for dining, not for pairing with dessert as so often Moscato wines are, and creates Salipetrj. It’s an incredibly original white, “anticonformist,” as he describes it, that embodies its essence in its name: the salinity (sale, salt) from the rocky earth (pietra, rock) into which its roots dig deep. Michele planted his espaliers of Moscato over salty rocks. Not one Sicilian has been able to convince him to adopt the local grape cultivation with the alberello technique. His Trentino origins make it impossible for him to think about cultivating vines without his trellises, which he won’t abandon – period. As for the rest, we will allow the Salipetrj to speak. We tasted the 2013 in a miniscule winery in a countryside home that had been abandoned not far from the sea. We sit among the barrels at a table draped with a long, white tablecloth that gives a sense of surrealism, seemingly painted by Magritte. We have already tasted the 2012 and 2011. In our opinion, the most salient point is how every bottle of Salipetry conveys its vintage, the sun, and the wind that helped grow it. With each wine, we recognize the urgent need to harvest in the middle of August, which is relatively early, and we taste the rocky, salty earth. In Michele’s wines, we taste the curiosity that led him to break tradition. He created an experimental wine that disregards the norm for vinifying whites in order to carry out the grapes’ unique course. This wine doesn’t want to be filtered; it surprises, it shakes up your go-to flavors of reference, it intrigues. We immediately think of pairing it with trout speck, the one the Armanini brothers make in Trentino, which just happens to be Michele’s home territory. The day we tasted Salipetry 2013, just sixty bottles of it remained. We bought them all, to share them with you – or at least, with those of you lucky enough to get the first 60 boxes. Many others will just have to wait and see what the wine, sun, and earth create for us from 2014.